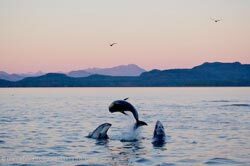 The waters surrounding Vancouver Island are a prime feeding ground for whales and dolphins, some of which migrate to tropical waters to breed. The striking black and white Orca or Killer Whale is the largest member of the Dolphin family. This toothed, predatory whale hunts in groups called pods. 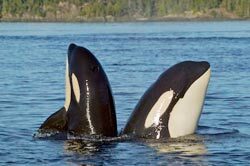 Divided into two populations, transient Orcas prey upon large marine mammals, while resident Orcas pursue fish and other small prey. Males have the tallest dorsal (back) fin of any whale, measuring close to two metes. The Humpback Whale is a baleen whale that filters its diet of fish, krill and shrimp through a series of plates that hang from the upper jaw. The "humped" back and mottled black and white fluke (tail) are the most common view of this whale in the water. Once hunted to near extinction, Humpbacks are now making a slow comeback. Pacific White-sided Dolphins are known for their playful acrobatics. Highly social, these small dolphins travel in large groups. The most common dolphin around Vancouver Island, they are identified by a black back, grey sides and a white belly. 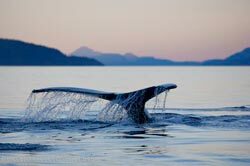 In addition to the above, Gray Whales, Minke Whales and Dall's Porpoise are frequently observed off Vancouver Island. Rocky shores and islets provide "haul-out" spots for sun basking Harbour Seals and Sea Lions. Harbour Seals are very curious, approaching kayaks and other watercraft. Superb divers, they feed on fish, mollusks and crustaceans and frequent estuaries where they can follow fish runs up-river. Large and powerful Sea Lions bark and roar from their crowded colonies. Males are polygamous, and have "harems" of females during the breeding season. The endangered Steller Sea Lion has a gently sloping profile, while the California Sea Lion has an abrupt forehead. The Sea Otter has a dense pelt that was once highly sought after, causing the near extinction of this mammal. Today, Sea Otters are often seen floating on their backs in kelp beds off the west coast of Vancouver Island. Large tracts of forest on Vancouver Island are home to many land mammals. Since the retreat of the glaciers 10, 000 years ago, Island populations became isolated from the mainland. Many mammals are therefore absent from Vancouver Island, and unique species have evolved such as the Vancouver Island Marmot, which is found nowhere else in the world. 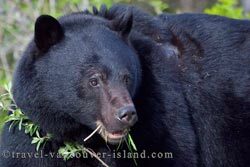 Black Bears are a common sight on Vancouver Island. Despite being large and heavyset, they can run at surprising speeds, and are agile climbers and swimmers. During the winter, bears find suitable denning sites to hibernate. On Vancouver Island, Black Bear attacks on humans are rare and precautions can be taken to avoid encounters. 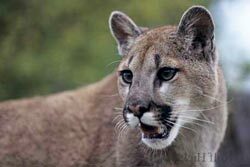 The Cougar, or Mountain Lion is a secretive animal that is seldom seen. With razor sharp claws and large canine teeth, Cougars are designed to hunt, and prey upon deer and elk. Measuring up to 2.5 metres long tip to tail, Cougars are North America's largest cat. The Black-tailed Deer is frequently seen grazing on vegetation along roadways. It is a subspecies of the Mule Deer, a larger species that is found across mainland BC. Deer are quite fearless of humans and frequent both urban and wilderness areas. The Roosevelt Elk is the largest elk species in North America, and lives in the rain forests of the Pacific Northwest. Roosevelt Elk have a large light-tan rump patch, a dark neck mane, and males have a heavy rack of antlers. Herds of elk are most often seen on the northern half of Vancouver Island. Vancouver Island supports a population of wolves. Highly social animals, they travel and hunt in packs, and are rarely seen by humans. The Vancouver Island Marmot, special to meadowed mountain slopes, is one of the most rare and endangered mammals of the world. The size of a large cat, these brown and furry marmots have a distinctive white nose-patch. Marmots are bred in captivity to help boost numbers. Today the total number of captive and wild marmots is exceeds 300 individuals. Many smaller mammals occur on Vancouver Island, such as raccoons, beaver, mink, marten, red squirrels, river otters and mice. Vancouver Island, situated on the Pacific Flyway, is a stopping place for great numbers of migratory birds. Central Vancouver Island is host to a large population of wintering Trumpeter Swans, which feed and forage in farm fields. Brant Geese arrive by the thousand in the spring to feed along the shore. Large rafts of ducks can be viewed in the winter, and in the spring, hummingbirds, warblers, flycatchers and swallows arrive to breed. 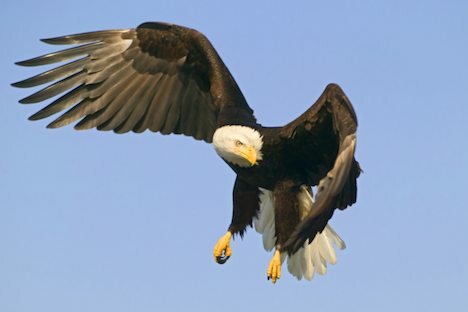 Of the resident birds, the majestic Bald Eagle nests in large trees. Elegant Great Blue Herons, standing stock still, fish along the shore and breed in large rookeries. With a temperate climate, Vancouver Island is a choice spot for bird watchers year-round. Picture of a bald eagle above the landscape of Vancouver Island, British Columbia, Canada.